Grid is a new and fast paced puzzle game in the same vein as Candy Crush or Bejeweled Blitz: players need to match three or more squares to clear the ‘grid’ and therefore pass the level. The game itself does have a couple of key differences to these gaming monsters, however, which Tapscape have decided to investigate. 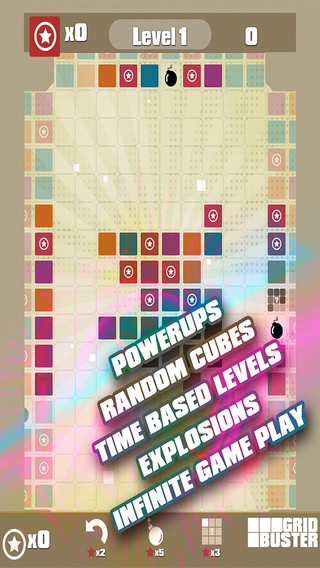 Grid Buster is a paid game on the app store available for the lowest tier of money. It is refreshing to see a game that hasn’t once again gone down the road of ‘freemium’ – the first big difference between this and games like Candy Crush. 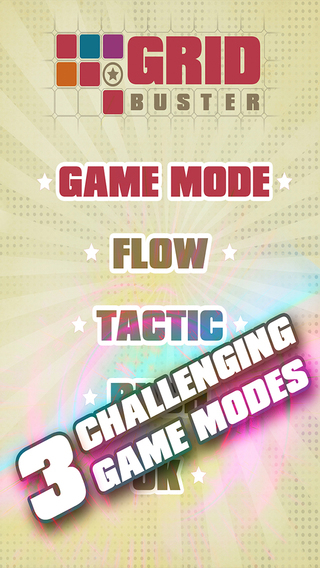 Once the game is open, three different game modes are offered to the player – Flow, Tactic and Rush – which can be played at either easy, medium or hard difficulty. 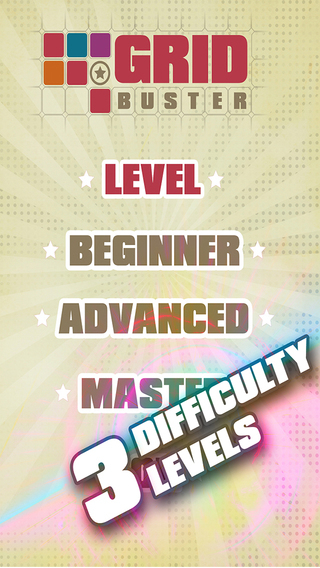 For players new to the game, fear not – there is a tutorial level available no matter which game mode you try to play. In all honesty, there were not a lot of differences between game modes and at times it was easy to forget which was which when leaving and then reopening the game. There is also a steep learning curve with this game, meaning that medium is a lot harder than easy and hard is darn near impossible. This said, the game itself certainly had legs – strategy was needed to ensure that a block did not impede another block, as well as creating increasingly more difficult situations to get out of. It was also possible to save yourself once pushed into a corner, which is a feature always welcome in a puzzle game. The graphics were simple and made the game easy to navigate and score – certain blocks are worht more than others, plus the game does have special blocks such as bombs that blow out a 3×3 grid on the board. They were certainly nothing to write home about, but colourful and cheerful and suited the manner of the game well. Grid Busters is a fun little puzzle game for the casual gamer. It has clear, unobtrusive graphics and an equally clear goal to match. Some of the mechanics seem a little overkill, such as the numerous game modes, but as with all applications these can be improved and it is exciting to see how these are expanded in future updates. A solid game from an independent, indie developer.